I sat down to write a blog post about the upcoming election this Saturday concerning the CATS Mass Transit Proposal. I started several different drafts of the post, trying to figure out how to address the myriad issues, both with the proposal itself as well as the arguments against the proposal. Every one of them seemed too lengthy (I know, surprise). I was getting frustrated and gave up on the whole thing, resigned to just continually barrage my Facebook wall and email contacts with this excellent Guide to the CATS Mass Transit Proposal put together by the Baton Rouge Area Foundation. Very easy to understand and full of facts without bias. …and then I received an email. Sent out by Q106.5, the email featured one of the most clearly worded and well articulated Frequently Asked Questions I have yet seen concerning the proposal. I’m pretty sure it’s a crib of several different Together Baton Rouge and Baton Rouge Transit Coalition documents, but it’s not like they’re turning it in for a grade. Great job to whoever put it together. So here you go: everything you have ever wanted to know about the upcoming election. Grab something to drink and settle in for a spell. 1) What is “Transit Reform” all about? Comprehensive Transit Reform has three components: Governance Reform, to strengthen the CATS board; an Election on April 21st, to create a dedicated revenue source for transit which will fund significant service improvements; and an Accountability Report Card and regular citizen evaluations, to give citizens the tools to hold CATS accountable for delivering service reforms as advertised and on time. Transit Reform is about improving the lives of people and the economic development of our community by providing a cost-effective alternative to travel by automobile and reducing traffic congestion and overall transportation costs for gas, insurance and car repairs. 2) Why does Baton Rouge’s transit system need more funding? The average Southern cities spend on public transit is $133 per capita. Baton Rouge spends only $27 per capita on transit, 20% of the Southern city average. This extreme and decades-long under-investment is a major factor in why we have such a poor transit system. The result is a system with 75-minute wait times, poor route coverage and one-way trip times of 2 hours, 20 minutes (the time it takes to get to Biloxi, MS). Baton Rouge appears to have the lowest per-capita funding on transit of any city in the country. 3) Why not have the riders pay for increased funding? Transit systems in Southern cities receive on average 14% of their revenue from rider fares. Baton Rouge already receives 25% of its revenue from rider fares, meaning that Baton Rouge already gets almost twice the revenue from rider fares than the average for transit systems. Increasing fares even more to pay for improved transit would put an even greater burden on transit riders who already pay substantially more than riders in peer cities. 4) If transit is so important, why doesn’t the Metro Council pay for it out of its regular budget? Nearly all transit systems around the country have their own dedicated revenue source, so that funding is stable and predictable. Very few systems — and virtually none in larger cities — are funded out of general municipal revenue. Baton Rouge is one of the largest cities in the country without a dedicated revenue source for transit. 5) If the April 21st election passes, the CATS system would receive $18 million in dedicated revenue and a total budget of almost $30 million. Is that too much money? $18.4 million in dedicated revenue and a $29.9 million overall budget was the amount recommended by the Blue Ribbon Commission as the minimum necessary to begin to build a modern transit system in Baton Rouge. This would bring CATS’ spending to $67 per capita, compared to its current level of $27 per capita — still a far cry from the Southern metro average of $133 per capita, but enough to build a high-quality, modern system. To put CATS’ proposed $30 million budget in perspective, the transit system in New Orleans has a budget of $76 million, serving a population 20% smaller than Baton Rouge’s service area. 6) Aren’t CATS buses sometimes empty? Why doesn’t CATS use vans or smaller buses? Buses are like retail stores — they have busy hours and slow hours. Most people talk about buses being empty because they see them in the middle of the day. At peak hours — early in the morning and in the late afternoon, when people are going to and coming from work — most bus routes are full or nearly full. Running smaller vehicles at slow hours would require two different vehicles per route, which increases costs substantially. Furthermore, smaller vehicles actually are more expensive than larger ones, because they have a shorter lifespan. The 35-foot buses currently in use cost approximately $340,000 and have a life span of 12 years, costing about $28,000 per year. The smaller, 20-foot vehicles cost approximately $250,000 and have a life span of 5 years or less, costing $50,000 per year. Shifting to smaller vehicles would waste about $22,000 per bus per year. 7) Has CATS been wasting our money? 8) How were these “peer cities” decided? The “peer city” analysis compared 10 significant Southern cities, which are the most likely to be in competition for businesses and residents. The Southern metro areas studied are Atlanta, Austin, Baton Rouge, Charlotte, Houston, Knoxville, Little Rock, Memphis, New Orleans and Raleigh. 9) I’ve heard that the April 21st election is taking place in a “gerrymandered district.” Is that true? The accusation of gerrymandering is simple misinformation. State law provides CATS with two options for elections — to hold them either within the entire parish or within the city limits of any municipalities within the parish. CATS is holding the election in the city limits because it tracks more closely with the density of the ridership. The election is taking place in the permanent city boundaries of Baton Rouge, Baker and Zachary, not inside a gerrymandered district. 10) Why were Central and the unincorporated areas of East Baton Rouge Parish left out? A key recommendation of the Blue Ribbon Commission was to align the area voting on and potentially paying for a dedicated revenue source more closely with the area that will be served by the transit system. There are no transit routes serving or currently planned for Central and most of the unincorporated areas, because low population densities in those areas that are not conducive to mass transit. Holding the elections in the cities of Baton Rouge, Baker and Zachary aligns the taxpayer area much more closely with the route service area. 11) But aren’t some of the transit routes outside of the city limits of Baton Rouge, Baker and Zachary? About 95% of route mileage is inside the city limits where the vote will be taking place. The main area outside those boundaries is in the southeastern portion of the parish, which includes several hospitals and the Mall of Louisiana. Those lines will be continued because residents who live inside the city limits need access to those locations. The options for the election were either to hold the election in the entire parish or in the cities, and the cities provide a much closer alignment between the taxpayer base and the area served by the transit system. 12) Aren’t our property taxes too high already? Historically, Louisiana has had extremely low property taxes and very high sales taxes, a system that places a higher burden on low-income residents. Louisiana ranks 51st in the country for property tax burden, behind all other states and Washington D. C. The chart below shows where East Baton Rouge Parish ranks on property taxes, compared to parishes and counties around the country. EBR ranking for property tax burden (after transit millage): 731st out of 792 U.S. counties/parishes (still one of the lowest in the nation). 13) Why doesn’t the homestead exemption apply for this election? State law prohibits the homestead exemption for all property tax elections that are municipality-based. The homestead exemption is only applicable to parish-wide tax elections and therefore cannot apply for this election. Similarly, all fire districts, the Baker, Zachary and Central school district taxes and all other municipal taxes that are confined to city limits are not subject to the homestead exemption because they are not parish-wide taxes. 14) Why is the Metropolitan Council being removed from operational decisions? In the past, accountability for the transit system has been split between two public entities, with decisions by the CATS Board over routes and fares subject to veto power by the Metropolitan Council. The Blue Ribbon Commission was unable to find a single other example in the nation with anything resembling this confusing, divided governing authority. The universal conclusion of transit consultants and the examples of best practices nationally is for the system to be governed by a single transit board, funded by a dedicated revenue source and accountable directly to voters. 15) How will we hold CATS accountable for results? The highest-performing transit systems in the nation are accountable directly to voters, who have the power to support or reject dedicated revenue in the future — the power of the purse. CATS no longer will be accountable to the Metro Council or Mayor or to any other politician; it will be accountable to us, the citizens who pay the bills. Together Baton Rouge and the Baton Rouge Transit Coalition are developing a comprehensive Accountability Report Card, to give the citizenry the tools to assess CATS performance on an ongoing and incremental basis. That Accountability Report Card will have benchmarks and timelines for delivery for every item of transit reform. Together Baton Rouge will meet with the CATS board and management every three months after the April election, to grade them on each reform item covered by the Accountability Report Card and assess the implementation of the transit reform plan. So there you have it: a lot of great answers to some great (and not so great) questions. 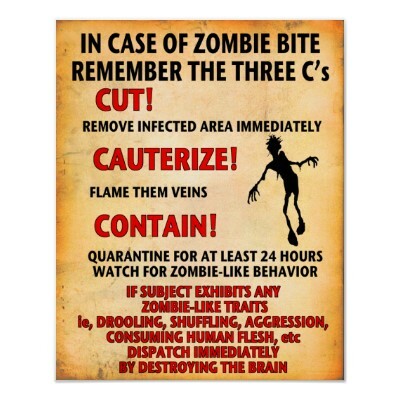 There may be a few additional quibbles (i.e. #12 doesn’t address our high sales tax rate, but even including sales taxes currently puts us somewhere in the middle of the pack total tax burden wise rather than making us taxed to the hilt), but generally speaking I think this addresses a lot of the issues. Apparently, some think this is what patriotism looks like. 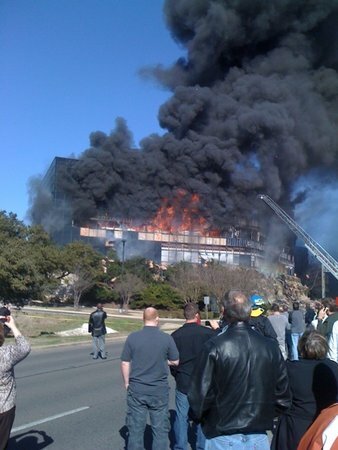 If you ask me, it looks an awful lot like 9/11 and Oklahoma City. It’s been a while, but recent events have compelled me to post. I wrote a little while ago about the potential for violence when political pundits and parties abrogate their responsibility to monitor and control their message. Sadly, I was proven somewhat prescient (not that it takes much to guess the inevitable). As most have heard by now, an idiot crashed his plane into an IRS building in Austin, TX, ultimately killing Vietnam veteran and IRS employee Vernon Hunter as well as his own loathsome self. This idiot’s name was Joe Stack. Not only did Stack perpetrate one of the grandest spectacle homicides in recent memory, but he left us a note by which to remember him. If you do decide to go down the rabbit hole, make sure to bring along this travel guide to help point out the landmarks in the fantasy land of delusion in which Stack lived. It’s a pretty convoluted world where a man who’s money and livelihood were “stolen” by the government still somehow managed to own a $200,000 house and private plane. Yeah, he was living hand-to-mouth. To me, the really interesting part of this tragedy is the contrast in the public reaction when compared with the Oklahoma City Bombing. Both were carried out by disturbed domestic terrorists fed up with the government. But Stack seems to have received much more support from the general public than McVeigh. McVeigh was generally reviled by everyone but a few fringe elements in the anti-government and white supremacy movement. Stack, on the other hand, has his own facebook fan page. To be fair, technological advances have eased the barriers of entry to getting your opinion heard on a grand scale, no matter how marginalized that opinion may be. At the same time, social media websites like facebook aren’t anonymous, generally speaking. When you register your support for something, you’re registering your support for the facebook-going public to see. Fully aware of this and at last count, 2,293 people have registered their support for “The philosophy of Joe Stack”. 2,293 people have taken an affirmative stance in support of the philosophical arguments espoused by a terrorist. That truly blows my mind. That type of rationale makes it hard for me to accept the defensive arguments of his supporters without a grain of salt. Further, I would have loved to see public reaction to a Muslim stating they did not agree with the methods of the 9/11 terrorists, but agreed with their anger against the United States. In my opinion, these statements of support are delusional and yet another display by a movement taking its cues from irresponsible leaders ultimately responsible for this tragedy. To understand my rationale, you need to understand important concepts underlying the psychological preparation needed to kill someone. During my time in the US Army, I read On Killing by LTC Dave Grossman. 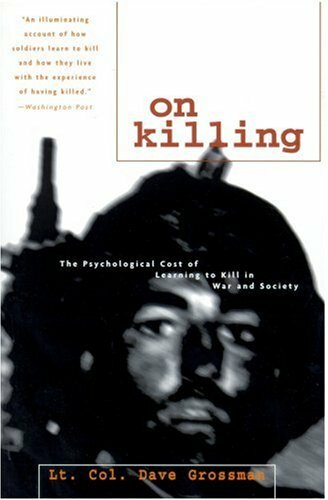 LTC Grossman’s book is a fascinating analysis of the situational and psychological factors that play into a human being’s ability to kill another human being. One of those factors is dehumanizing the enemy. In recent conflicts, the military has accomplished this through the use of human-shaped target silhouettes and derogatory nicknames. It’s the latter that draws my attention. The current partisan political discourse, both within the government and without, invites just the type of dehumanization needed to overcome inherent limits on a human being’s ability to kill. When last I wrote on this topic, I presented Jim David Adkisson as an example of this phenomenon. Adkisson murdered two members of a Unitarian Universalist church in Knoxville because he hated Democrats, liberals, African-Americans, and homosexuals. Adkisson’s personal library contained writings from such luminaries as Mike Savage, Sean Hannity, and Bill O’Reilly. Since Adkisson’s rampage, the partisan divide has only become more strained and, not unsurprisingly, we now have another example of this phenomenon in the form of Joe Stack. To the pundits and politicians who gleefully vilify the opposition, you need to take a hard look at what you are doing and saying. Focus your efforts on the issue, not the person. I realize it probably helps you sleep at night to think you can disassociate yourself from the actions of someone you have influenced. I also realize it is unlikely you understand the psychological rationale required to kill a person as most of you never served in any branch of the military. While you can deny your culpability in any deaths that result from your influence, the simple fact is that you are playing a necessary role in the dehumanization of an innocent person. Simply consider this: if Joe Stack had viewed the IRS as an organization of hard-working human beings with the unfortunate job of collecting taxes rather than as a leviathan evil responsible for his sorry lot in life, Vernon Hunter would likely still be alive today.